Have you noticed how popular infinity scarves have become recently? I am one of those people who have fallen completely head over heals in love with them. They are on my neck all the time. Almost. Actually, my love for infinity scarves has grown so big that I used some free time during the Holidays and made my own one. And you know what? It’s really simple. This is what I did: I cast on 60 stitches and following a simple ribbing pattern (knit 1, purl 1) I created a scarf that was about 70 inches (180 cm) long. I used this yarn. It was a last year’s Christmas present from my Mom and I finally found the right project for it. The yarn looks really interesting, like a chain of crocheted stitches, actually. It was a pleasure to work with. Thank you, Mom!! I then bound off all stitches, lined up the cast-on edge with the cast-off edge and sewed the ends together. The scarf is now a complete circle and ready to wear. I think I might make a crocheted version too. Soon. Yay!! This is really nice scarf. The colours are amazing, and most importantly it looks cosy and warm. Well done! Wowwwww well done Petra.Its just awesome!!!! Hello petra i like so much the scarf ! so can you do a tutorial about it ? Where can I purchase this yarn used for the scarf. I love the looks of it andIcanmakeitformy grandaughters. What ply yarn did u use? I love this pattern. How many balls of wool did you use? I want to make one like it but I’ve seen so much info I’m confused. What is the ideal size to be able to do all that with it? I’ve also read you have to twist it before joining it, like a Moebius band. Which way do you think will work best for the versatility I’m looking for? Thank you for sharing it is really beautiful. Thanks for sharing the pattern..I have a heavier wool ‘Bernat Roving Wool..2 skeins of it, but am not sure what size straight knitting needles to use..thanks for any suggestions. Are there any US sites that have the same exact skein as the one your provided in the comments? I notice the one you shared comes in at 229 yards. Everything else I see under US online sites are about 100 yards shorter… I live in the US and I assume the shipping from a UK site would be defeat the purpose of buying it because I then would sale it once I make the item. Hi, how wide was the scarf? This one looks like its a nice width but as im not going to use the same yarn, i wont know how many stitches to cast on. But this is very helpful! Thank you! Love love love the scarf! Thanks for the simplicity of it! So I am attempting to make this right now and this will be my first ever knitting project. And I don’t know if I am doing it quite right. When you finish 1 row and start on the next you still start by k1p1, right? Sounds kind of stupid. Lol. But hopefully it will turn out! what size needle do u use for this pattern? I just discovered your blog today and I love your scarf. How many skeins/grams did you need to knit this beauty? I made the scarf flat and then simply sewed the ends together. 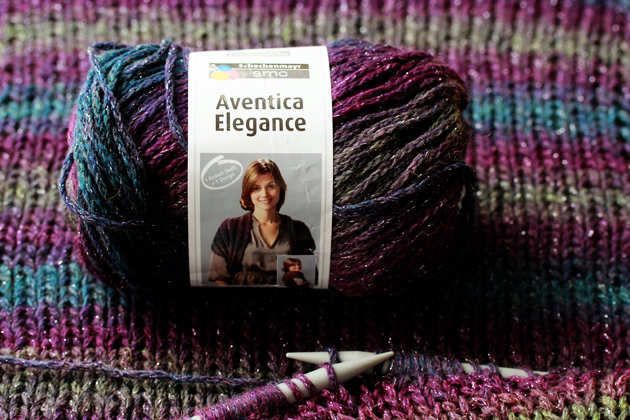 Are there any yarns that compare to Aventica Elegance. In the U.S.? i know this yarn. 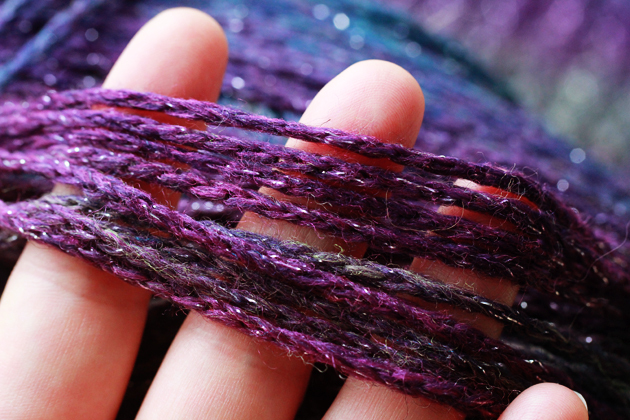 in the north america it’s red heart boutique midnight yarn. there are so many beautiful colours of it. Thank you so much for posting your beautiful infinity scarf! I just completed my own version using your post as a guide. 🙂 I used a heavier yarn than you did, and it came out beautifully. Thank you for sharing! I love the scarf and am about to begun one. The girl at my knitting shop matched me with Plymouth Encore Chunky and told me to use 10 kneedles and my granddaughter wanted a solid color. 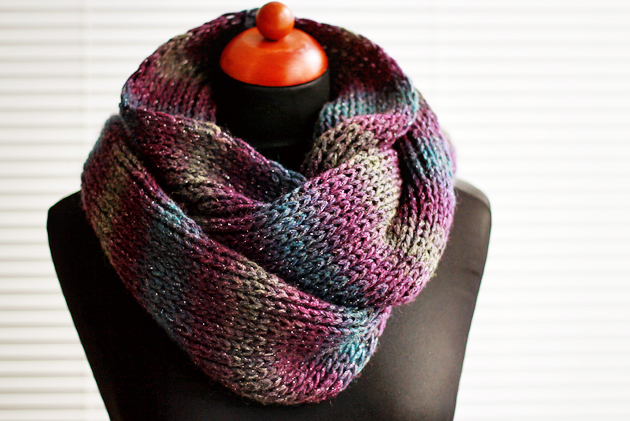 How do you keep the edges from curling in on the scarf? 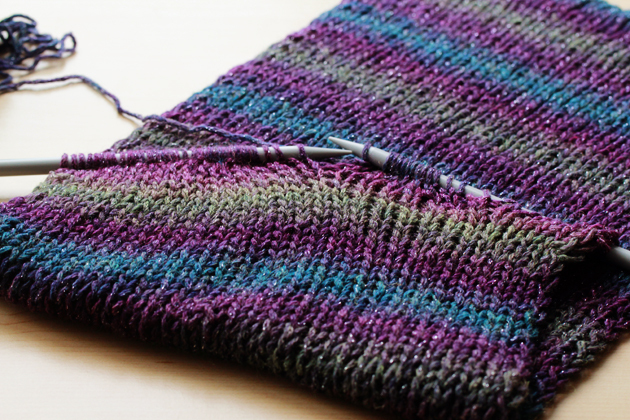 Do you slip any stitches at the beginning and end of each row. Would appreciate a response before I begin. Thank you. Thank you……knitting? size 10 knitting needles…..you have a novice here…it will be OK will knitting too? This is exactly what I’ve been looking for! Would it be possible to knit this round so that in the end sewing the ends together would not be necessary?! Thank you!!! Hi! This looks awesome. I am trying to get into knitting but there is no way I can go to an actual knitting shop, so I am doing the shopping online. I think I want size 8 bamboo needles, and I read online that I should get worsted wear wool yarn. I have no idea how much to get, or how thick the yarn should be. Help? 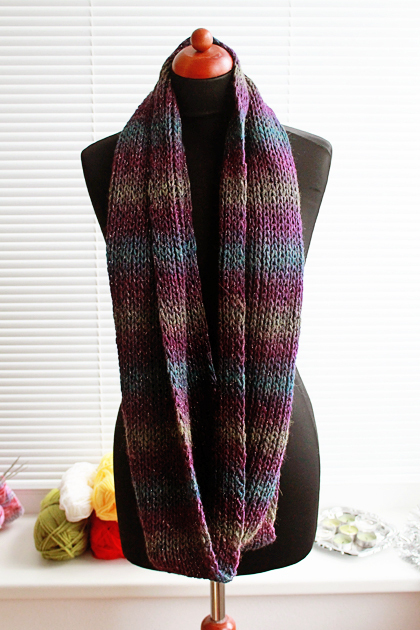 I want to make an infinity scarf. I am from canada and was just wondering if you are using us 9mm or canadian 9mm knitting needles? how do you close it to be one circle? can you please direct me to instraction? Knit 1 st and purl 1st. Or knit 1 row and purl one row? I am new at this. Thanks in advance. Hi Petra…Just a little tip. 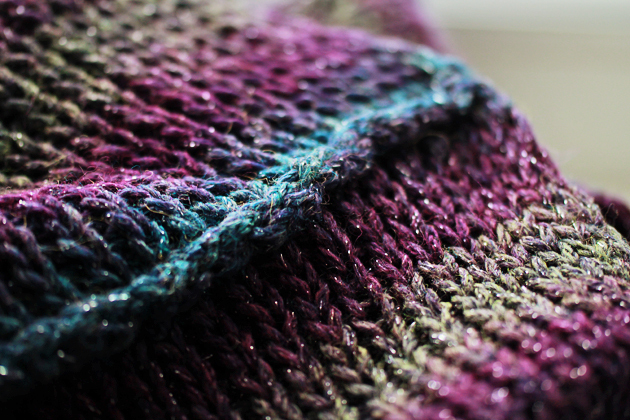 If you want to make your infinity scarf with a seamless bind, try doing the Kitchener stitch. I didn’t know how to do it at first but then looked it up on line and there was a great you tube video. I love the finished product.